The Village at Shirlington in Arlington is well-known for being dog-friendly, with many restaurants allowing patrons to bring their pups while dining al fresco. But Palette 22 has taken it a step further, hosting a “yappy hour” every Tuesday with a special menu just for dogs. There are three entrees the kitchen will prepare and serve for pooches, including grilled sirloin, yogurt and apples, and beef and rice. So while you’re enjoying delicious exotic small plates of tacos vampiros, bulgogi beef or patatas fritas, your pooch can enjoy equally mouth-watering dishes right next to you! Humans can take advantage of drink and food specials during Palette’s yappy hour as well. Yappy hour is every Tuesday through September, from 4:00 to 7:00 pm. However, if your pup has a craving, the pooch menu is available all the time! The girls gave the Doggie’s Dream entree two paws up, devouring it in seconds with not a morsel left in the bowl. With Americans spending over $69 billion on our pets in 2017, according to the American Pet Products Association, it’s obvious we like to spoil our pets. But how awesome would it be to spend quality time with your pooch, while pampering YOURSELF? You can, at Adara Spa in Shirlington! Once a month, the spa hosts a “Dog Day”. Dogs can come in to the spa, join you in the treatment room, and enjoy yummy treats. Best of all, the spa offers discounts and special offers on a variety of services for humans, including facials, light therapy, and more. Sundae and I went in May, and had a blast. She jumped right up on the reception area chair, like the Queen Bee she is, acting like she owned the place. After I settled in for a Pumpkin Facial in the treatment room, she checked in with me with wet-nose ear snuffles periodically as Leah applied the lotions. During the portion of the facial where you relax and let everything soak in, Sundae decided to jump up on the table and drape herself across me. Ooof. But honestly, I loved having her there with me, and she got LOADS of attention from the staff and other customers. The next Dog Day is July 19. Appointments fill up fast, but you can always stop by for the dog treats and schedule a discounted treatment for another day. And I’ll let you in on a secret–dogs are ALWAYS welcome, it doesn’t need to be a Dog Day to bring your pooch to keep you company during your treatment. Were you SO bummed that the Old Town Alexandria Fun Dog Show and St. Patrick’s Day parade was cancelled when Winter Storm Riley blew into town? Well, everyone has the luck of the Irish this time, the parade’s been rescheduled to this Sunday, March 18. A day late of the actual holiday, but never a dollar short, this parade is chock full of pipe and drum corps, classic cars, Irish dancing and dog breed groups. It all begins at 11:30 am at Market Square with a fun dog show, then the parade kicks off at 1:30 pm. Take note, the parade route has been revised, so don’t be the only person standing on a corner wondering where the bagpipes are! More dog-friendly fun is at the Super Pet Expo at the Dulles Expo Center in Chantilly March 16-18. This is one event that the weather can’t wreck, since it’s indoors. Bring your pup along for demonstrations and play areas, but best of all, SHOPPING! There’s dog and dog-lover gear galore. My best SPE purchase was really cool LED night collars from Lumi Pet that don’t need batteries, you can charge them in a USB port, right next to your iPhone! So now when I’m standing at the back door hissing at Chatham to come inside RIGHT NOW because it’s freezing, at least I know where she’s lounging in the yard, pretending not to hear me. Happy weekend, and happy dog life! The “end of summer” can be many different days, depending who you’re talking to. For kids, it’s the last day before the first day of school. Officially, this year it ends on Sept. 22. 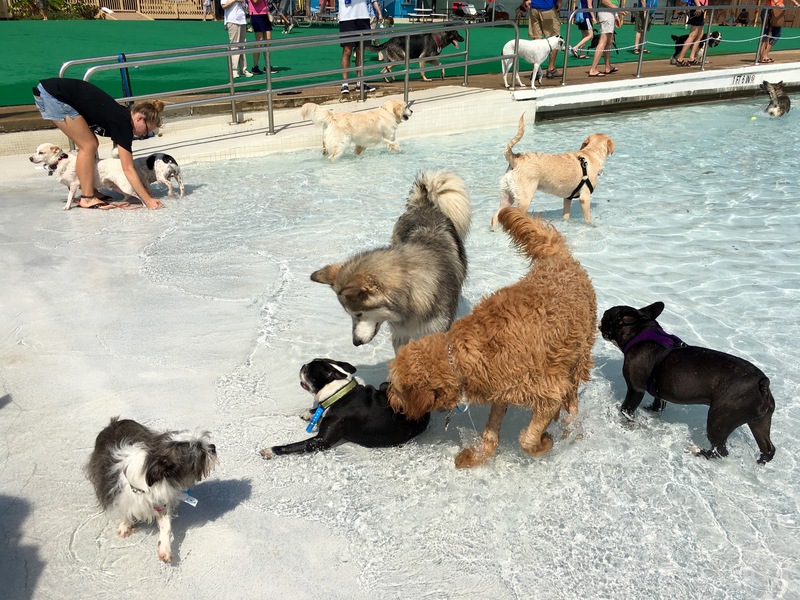 But for owners of water-loving dogs, it’s when the pools close for the season and hold their annual dog swims! 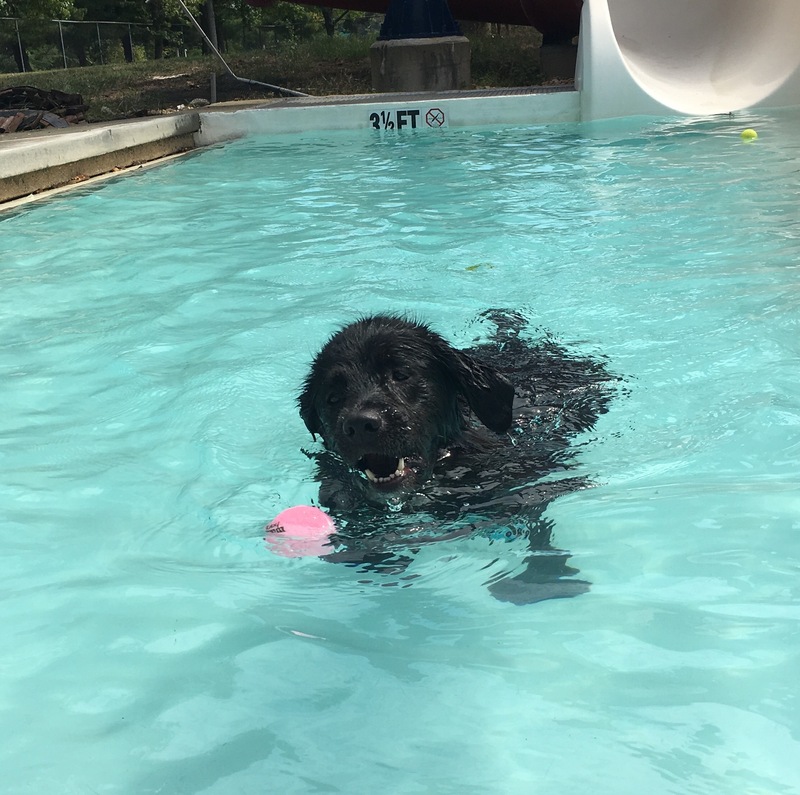 This year, the dog swim day for all five Northern Virginia Regional Parks Authority water parks is this Saturday, Sept. 9. 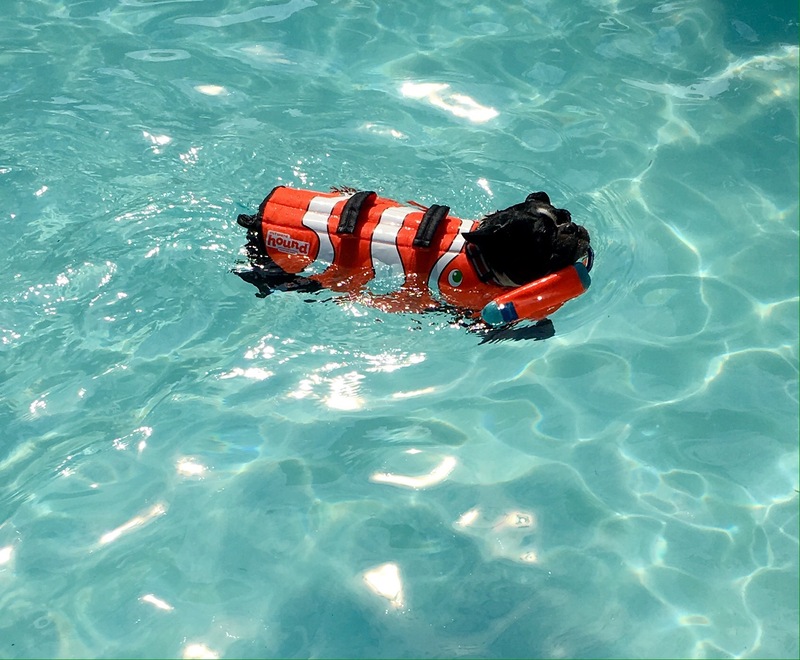 From 10:00 am to 2:00 pm, for just $5, your dog can frolick, dive and doggie-paddle to his or her heart’s content in the cool, blue waters that only human kids got to enjoy all summer. I prefer the NVRPA dog swims for two main reasons. One, Chatham is getting older and doesn’t dive anymore. The water parks have step-in, shallow pools and wide, gradual steps that make it easy for her to get in and out. Second, the parks are huge, meaning there’s no scrum of excited, nervous dogs crushing around a single entry point, which can lead to doggie disagreements. There is plenty of rooms for dogs to run and multiple pools to choose from. Make sure to download and fill out the waiver before you go, and bring proof of current license and rabies vaccination. It’s supposed to be spectacular weather on Saturday, get out and enjoy the mid-70s temps while you can! This Sunday, July 16, Dogma Bakery in Shirlington is celebrating National Ice Cream day with free doggie ice cream in the courtyard in from of the shop from 2 to 4 pm. Dogma’s treats and ice cream are all natural, homemade, and have ingredients like carob, carrots, and cranberries. Forget about the four c’s of diamonds, MY girls go gaga over the c’s in Dogma’s delightful treats! And, humans may even get some sweet treats, too. Dogma is at 2772 S Arlington Mill Dr, Arlington, VA 22206. There’s two great events Sunday, June 25, in Arlington for dogs and their owners. From 4 to 6 pm it’s Pups N’ Pints hosted by BarkHappy DC at Barley Mac, 1600 Wilson Blvd, Arlington. Drink specials, goodie bags and a dog trick talent show are among the offerings. The event benefits the Humane Rescue Alliance. Tickets are $15. 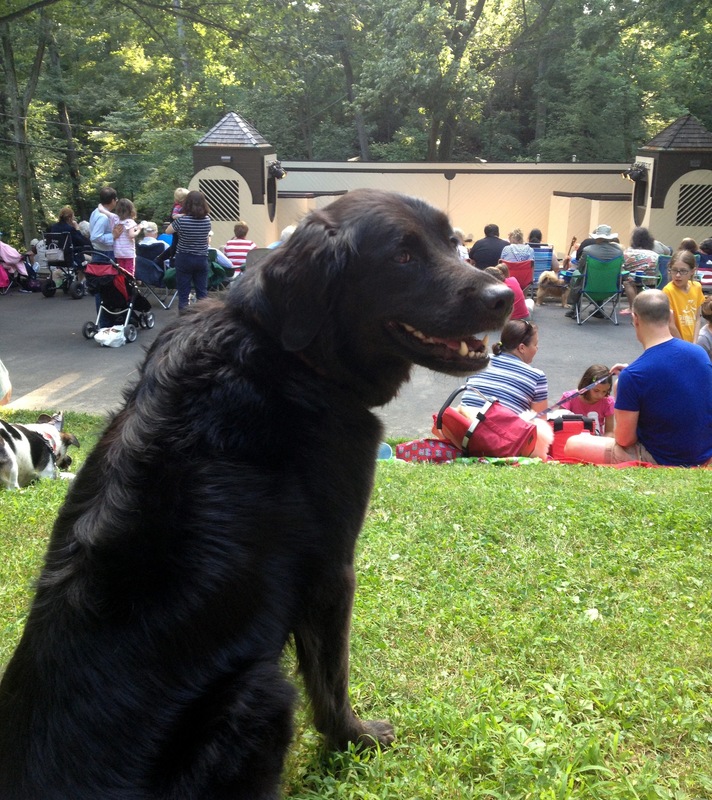 Then hop over to Lubber Run Ampitheater for Pops for Pets, a benefit performance for the Animal Welfare League of Arlington by the Arlington Philharmonic Orchestra from 6 to 7 pm. There’s plenty of parking in the adjacent residential neighborhood. The event is free, but donations for AWLA are always appreciated!